Animated Film Reviews: Walt Disney: It's a Snap! Every so often, for absolutely no reason at all, I post a few little-seen shots of the animation master, Walt Disney. Why not? 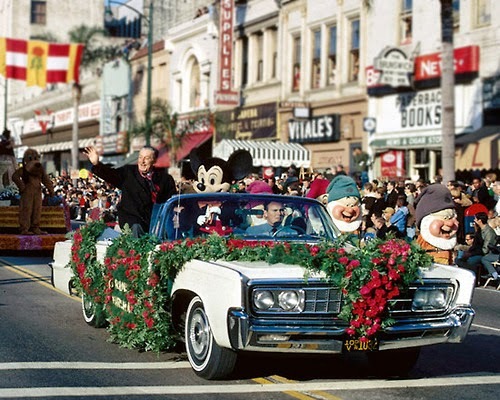 Above, Walt Disney serves as the Grand Marshal at the 1966 Rose Bowl Parade, accompanied by Mickey, some elves, and a pretty smooth ride. Could you imagine Walt Disney himself appearing, open limousine, fearless and greeting his fans? That's just a fabulous occurrence right there. Sad to say, he passed away later that year. Walt is glad you came, and wants to preserve the memory with his Kodak Instamatic! Below, Walt shows that all this animation business is simply a snap! And he's off to take care of business with his buds.